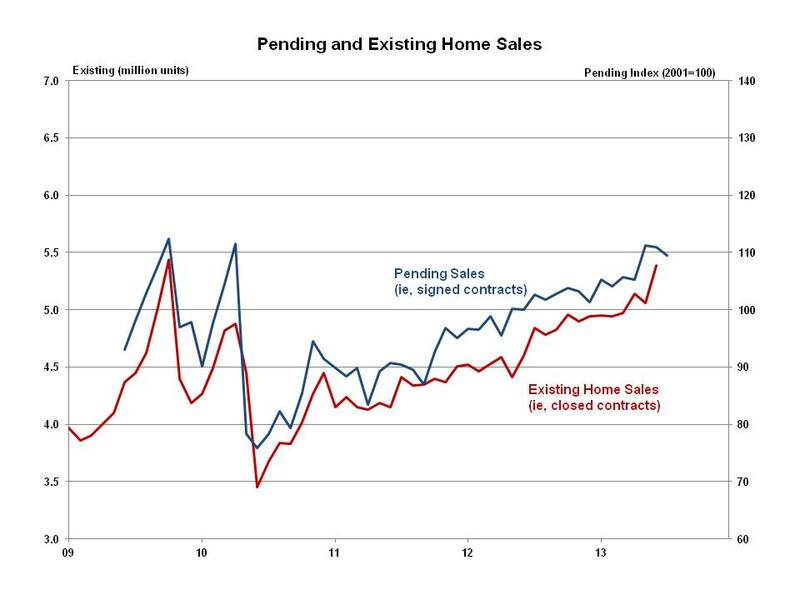 The Pending Home Sales Index (PHSI), a forward-looking indicator based on signed contracts, fell 1.3% in July 2013 to 109.5, down from 110.9 in June. The July 2013 PHSI reported by the National Association of Realtors (NAR) was 6.7% higher than the same period a year ago, and represented the 27th consecutive month that pending home sales have been above their previous year levels. The July PHSI dropped 6.5%, 1.0% and 4.9% in the Northeast, Midwest and West respectively. The July PHSI increased 2.6% in the South. Year-over-year, the PHSI increased 3.3%, 14.5% and 7.7% in the Northeast, Midwest and South respectively. The PHSI declined 0.4% year-over-year in the West. The PHSI has now declined two consecutive months. But existing home sales reported by NAR a week ago increased by a robust 6.5% in July to a seasonally adjusted rate of 5.39 million units combined for single-family homes, townhomes, condominiums and co-ops. It is worth noting that existing homes sales are reported on a contracts closed basis, so they reflect market conditions with a longer lag than pending sales. July 2013 single-family existing sales increased 6.3%, whereas condominium and co-op sales increased 8.6%. While the median sales price for all housing types decreased slightly to $213,500 in July, it was the 17th consecutive month of year-over-year price increases. The first-time buyer share of existing sales remained unchanged in July at 29%, and was down from 34% during the same period a year ago. The individual investor share dropped to 16% in July, down from the cyclical peak of 22% in February 2013. Today’s PHSI report follows a period of mixed signals. Builder sentiment reported on August 15 increased robustly, but single-family starts reported by Census the next day dropped 2.2%. The strong July existing sales report was followed by a 13.4% decline in new home sales reported on August 23. The PHSI has been a good indicator of what happens to existing home sales when the contracts close in the next couple of months. However, the relationship has not been as strong over the past month, and mixed signals might continue until the impact of higher mortgage rates and prices resonate throughout the market. This entry was posted on Wednesday, August 28th, 2013 at 11:28 am and is filed under Data. You can follow any responses to this entry through the RSS 2.0 feed. You can leave a response, or trackback from your own site. The latest PHSI report is more evidence of how critical low interest rates are to the continued recovery of housing. While the 6.5% increase in existing home sales appears to be a positive, this statistic is based on sales closed in July, meaning that most of these sales went under contract before interest rates began to spike. Since the new home sales statistics are based on contracts actually signed in July, they more accurately reflect the affect of the interest rate increase since consumers were aware of prevailing rates when they purchased.. This is reinforced by the PHSI statistic which reflect the lower number of contracts signed since the increases started in May and the higher number of sales closed in July. Rising interest rates are much more of a problem during this recovery than those of the past because of the many changes made by the government which make it much harder to buy a first home. Unlike past recoveries, sellers have been stripped of many of the tools used to spark sales.